Welcome to my review of the Martin Saber. - Extremely comfortable to hold; you’ll want to keep shooting it. - Smooth to draw and carries an arrow like a beast. (costs a few dollars) after a year or so of shooting, depending on how often you practice. 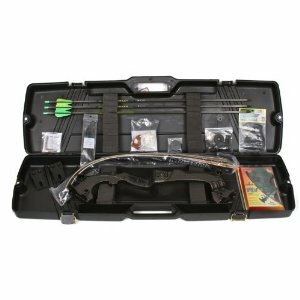 Martin Archery – The True Experts? 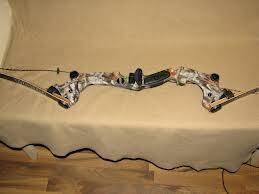 Do you like accurate and affordable recurve bows? I do. 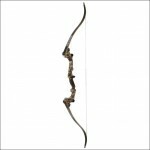 And Martin Archery definitely seems to like them as well. In fact, I’ve never seen them produce an inferior product (except for a few exceptions, which were promptly taken off the market and were only re-introduced once the defects were taken care of). The Martin Saber is a particularly good piece of equipment, which is exactly why it earned a spot in our top 10 best recurve bows list. You’d probably like to know what makes it so special though, so let me explain. Let us begin by taking a look at their Riser. Martin is known for using aluminum in the making of their risers, and while this is somewhat different than the traditional wooden constructions you are probably used to seeing in traditional bows, it’s definitely not a bad thing; you see, being made of aluminum means that the riser is both durable and lightweight, which are both important things to look for. But what other good stuff has the Martin Saber riser got to offer? it once, you really won’t be able to let go. And the good news is: the exact same is true in the case of the Martin Saber. You’ll love it. All of this is possible thanks to the Thermal V protective dampening grip that was introduced by the manufacturer. In addition, two Vibration Vortex V.E.M.’s are integrated in the riser, reducing vibration even further and making the Martin Saber really quiet to shoot. 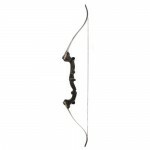 The arrow rest is made of rubber, which is likely the only flaw this bow (and most other bows in this price range) has. While it often doesn’t cause any issues, some people experience wear of the arrow rest with time. This can be amended easily by simply purchasing a metal arrow rest (the Martin Saber accepts all the ones available on the market), which you can get for as little as $3-$10. No Martin Saber review could be complete without at least a mention of the limbs’ quality. Made of laminated wood and glass, you’ll find them to be really durable and capable of sending an arrow through the air with complete authority. The limbs don’t have a tendency to bend as time goes by (thanks to the high quality lamination used by Martin). But there’s more. Since the Saber recurve is a Take-down bow, it means you can quickly and easily remove the upper and lower limbs from the riser by simply unscrewing two screws. This is particularly important since this is a pretty long bow, so transporting it might have been somewhat of an issue for some if it weren’t for the take-down nature of this recurve. The whole procedure is really simple and doesn’t take more than a minute to complete. This also means that you don’t need to purchase a bow case to transport your weapon, since you can easily place it in a medium-sized handbag after it’s been disassembled. 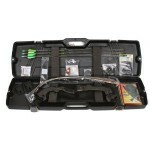 Unless, of course, you simply think bow cases are cool, just like I do, in which case you’ll get one anyway. The draw is hard to explain… Even at only 40#, it was very firm yet smooth… It was a steady increase all the way to my 27.5″, but you were left with no doubt to how harshly it was going to throw the arrow. I might personally add to the above that the bow feels the same not only at the 40 pounds draw weight, but also at the higher ones; I own the 50 pounder and have found it to be really easy and exciting to shoot, as I can focus my entire attention on hitting my target rather than having to wrestle the weight. You’ll love just how natural it feels, at least I strongly believe so. Why is it this good though? A really cool total length of 64 inches, which isn’t easy to come by in this price range. In case you didn’t know: the longer the bow, the more accurate it is. Accuracy is fantastic as well. The brace height is forgiving of a beginner’s form mistakes and does not result in “string slap” at all. There’s no torque or side-to-side swaying of the limbs involved upon release. To sum up this Martin Saber review, I will just say that it will provide you with years of quality shooting, regardless of how experienced you are as an archer. 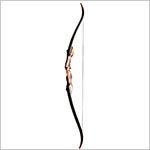 Beginners, intermediates and advanced – they all have to appreciate the simplicity and effectiveness of this bow’s design. Take a moment to check out Today's Amazon.com price on the Martin Saber. Do you know if you can eventually purchase heavier weight limbs for the Martin Saber? I’m considering purchasing the Saber at 40#, and then building up once I build good habits. Yes of course, that’s the beauty of Takedown recurve bows. You can replace the limbs for “heavier” once in the future when needed. Awesome- thanks! I’m in a quandary over choosing the Samick Sage or the Martin Saber. I’m drawn to the longer limbs of the Saber, and though the price is a bit more for the Saber, I just seem to like it more. Any advice? If money isn’t an issue in this case, then I’d go with the Saber. Also, you’ll probably find it much easier to buy new limbs for a Martin bow than for a Samick bow (I feel Martin has better support for accessories and replacement parts). I’ll soon be 66 years old. I used a compound years ago. Even though I’m 6’2″‘ and 240 lbs, should I begin with 35# limbs on the Martin Saber? Yes begin with a bow that you can comfortably shoot while learning and maintaining proper form. Shooting a recurve is different than a compound so you need to have a bow with a light enough draw weight that you can focus on your form and not the strain of holding a heavy draw. Also, the benefit of a takedown bow is that after you learn proper form and technique, you can always order limbs with a heavier draw weight and basically have two bows. One light and one heavy. Any suggestions for a Leftie? I’m a relative beginner, been shooting about 6 months and looking to move up to something a little nicer. Would like to stay under $250 if possible. Wonderful writing and concise, informative prose, many thanks! After having used the Martin Saber for a few months based on this review, I agree with a lot of the things here. A few points in my very inexperienced opinions is that the Saber needs some tuning (like all bows) to increase the brace height, particularly for a taller archer to avoid string slap and reduce vibration. The other issue is that the arrow rest is fairly durable, but it’s hard on fletching. If you practice a lot, you may want to look at either one of those cheap “lightweight” rests like from Hoyt which are fragile but disposable, or one of those spring loaded ones. I know everyone wants to attribute accuracy to equipment but that step alone increased my accuracy and decreased the wear on my fletching substantially. The last point of mild disagreement with your excellent writeup is that, in my limited experience, at this price range or less the limbs are not that much less expensive than the whole bow. 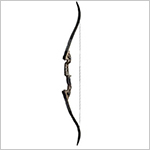 For something in the 100-250 dollar range, the limbs are 70+% of the new bow purchase price. 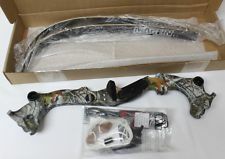 For the Saber which is a 220-250 dollar bow, the limbs are about 150-160 dollars. It’s not that hard of a call when you consider for example that the screws and bolts, unlike some of the more customizable bows that you can order parts and build yourself, cannot be purchased individually. Obviously the more expensive the bow, for example like compound bows, buying new limbs alone makes more economic sense instead of buying a new bow. At the Saber’s price range and below, the difference is so small versus buying a new bow that it almost makes more sense to just buy a second bow if only for the luxury of having a full set of spares. Wonderful review of an item with excellent “value”. I’m thinking of getting the sabre is the panther much better and if so why. Money isn’t to much different. Thanks for a reply! I’d it okay if the bow is taller then me? 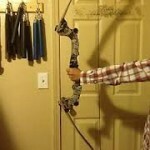 I’m 5′ even and done growing, and would love to get into archery but I’m not sure if I sold try to find a shorter one. Hello. 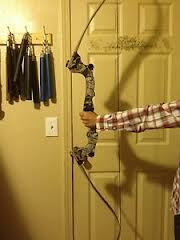 It might be a dumb question but how do I know the maximum draw length of a bow like this when it is unspecified? I lost the items needed to bolt the limbs onto the riser of this exact model, deployed and moved twice and no clue where they are. 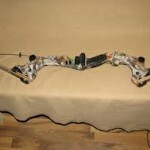 What are the parts needed to put my bow back together? Bolts and? Also, where can I get them? Thanks for any help.